Australian Geographic, April-June 2001, p.35. Rollo Kingsford-Smith, DSO AM DFC, flew in Australian and British squadrons from 1939 to 1945, achieving the rank of wing commander, and went on to act as an aide de-camp to Her Majesty the Queen. Since 1994, he′s been a director of Ausflag, an organisation dedicated to securing popular support for a new Australian flag. We Australians are rightly proud of our way of life, our culture and our multiracial population. In my opinion, it′s time our flag represented these characteristics. I have no doubt that the adoption of an appropriate new flag will help make Australia a stronger nation. Our current flag is viewed with indifference by many Australians. I live in the Southern Highlands of New South Wales, a few hours from Sydney, and the Australian flag doesn′t fly at our council chambers, courthouse, high school, or even above the historical society building. In the USA, on the other hand, people don′t hesitate to show their reverence and pride for the Stars and Stripes and display it as often as possible. The Canadians, too, have enthusiastically adopted the striking maple-leaf design that replaced their old colonial flag. Closer to home, Australia′s Aboriginal peoples are passionate about their flag, which was an instant success when it first appeared in 1972. So, why don′t more Australians take pride in our beautiful ensign? I believe that we′re ambivalent towards the flag because it no longer represents our collective identity. Although the Union Jack that it prominently displays is an important part of our heritage, it′s still known the world over as the flag of another nation. Throughout history, a flag′s primary role has been to clearly communicate identity. Hence, to be successful, a flag must be distinctive and unambiguously represent those who fly it. Our flag fails to do this – it can be easily mistaken for any one of 39 similar flags, and in my experience, few people overseas recognise it. Even the Canadian Government raised the New Zealand flag during a visit in 1985 by then Prime Minister Bob Hawke. Perhaps the most common argument against change is that Australians fought and died for the flag, and any alteration denigrates their sacrifice. 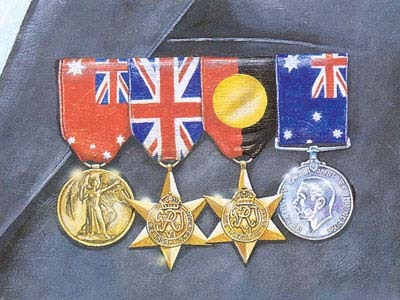 As a serviceman in World War II, I saw my share of fighting and witnessed the deaths of far too many Australians in combat. However, I certainly didn′t fight for the flag and I didn′t know anyone who said they did. Success and survival in war depend on luck, skill, determination and discipline - when you′re in the thick of it, there isn′t time to be worrying about something as irrelevant as a flag. This argument also conveniently ignores the fact that few Australians who fought in the two world wars did so under today′s flag - the majority of those who served under a flag would have done so under Australia′s Red Ensign, the navy′s White Ensign or the Union Jack. The flag we now fly was proclaimed our national flag a mere 47 years ago. At Federation in 1901, when Australia won self-government, the design of our new Commonwealth flag was chosen after a competition. The flag required "imperial" acceptance, provided by King Edward VII in 1903. Two flags received approval, one with a red background and one with a blue background. Both featured the Union Jack, a six-pointed star representing the six States (a seventh point was added in 1909 to symbolise the territory of Papua and, later, any other territories), and the stars of the Southern Cross. The blue flag was for official purposes, while the red flag was for commercial uses. The latter became the people′s flag, and growing up in the 1920s and ′30s I never saw a Blue Ensign. My family had a flagpole in the garden, and on special occasions my brother and I would fly the Australian flag, always the Red Ensign. At school, when we saluted the flag it was again the Red Ensign. In 1953, the Menzies Government, without a great deal of fuss or debate, decreed that the Blue Ensign would become our national flag, and the Red Ensign, to which I was rather attached, disappeared from view. While Australia isn′t the divided country portrayed by some, neither is it truly united. I believe that a new and distinctive Australian flag would play a significant part in bringing us together, whatever our background. The design of the new flag is best left to experts. In my opinion, it would be better not to feature the Aboriginal flag – it belongs to indigenous people and shouldn′t be used by other Australians. My preference is for simply taking away the Union Jack, leaving the Federation star and the Southern Cross, which has been in our skies since time began. This would create a beautiful flag and an easily recognisable symbol for our country.